It’s no secret that Black women have played important roles in the dance world, and paved the road for many of today’s dance stars. From Raven Wilkinson to Debbie Allen to Laurieann Gibson, we’ve seen and heard of Black women doing the seemingly impossible—and succeeding and breaking down barriers within a number of dance styles. With Misty Copeland being the first Black principal dancer at American Ballet Theater, and even creating a program that allows more young girls of color room within the world of dance, she is not the only one making strides. Let’s celebrate the many other dancers and choreographers that have added to some of our favorite performances and dance routines. Beginning her dance career at the age of three, Detroit native Monica Wilson studied under Gregory Hines and many other influential dancers. In 2002, she auditioned and was selected for the Detroit Pistons Automotion Dance Team, leading to her reputable career as a professional dancer and choreographer. Wilson has worked with an array of artists including 112, B.O.B., Trina, and Jennifer Edison. Though mostly self-taught, Kaelyn “KK” Harris began dancing at age 5. Early in her career, Harris performed on professional dance teams for the WNBA and the Entertainment Basketball League. Harris has assisted choreographers such as Laurieann Gibson and Dave Scott, as well as worked with artists such as Sade, Willow Smith, and Ciara. Among winning many awards, including the World of Dance’s Youth Choreographer of the Year Award, Harris was on MTV’s America’s Best Dance Crew with the group 8 Flavahz. She now works as a choreographer, selling out classes around the world. A member of the New York City Ballet’s corps de ballet, Olivia Boisson is a native of Queens, New York. Boisson began dancing at the age of 6 with the The Ballet Arts School of Forest Hills. She later studied at the Dance Theatre of Harlem in 2000, before becoming a full-time student at the School of American Ballet in 2004. In 2012, Boisson gained her current role as a member of the New York City Ballet’s corps de ballet. Sixteen year Alvin Ailey veteran Linda Celeste Sims began her training at the Ballet Hispanico School of Dance. Sims has been featured on the cover of Dance Magazine and won various awards, including Outstanding Performance at the 2014 New York Dance and Performance Awards. Sims has also been featured on So You Think You Can Dance, The Today Show, and has made guest appearances at the White House dance series and galas in Budapest and Vienna. She is a certified floor-barre instructor, teaching classes all over the world. The face of Pharrell’s "Marilyn Monroe" single, Khadija Shari Nicholas (mainly known as Khadija Shari) began her dance career with training at the Ailey School, Harlem School of the Arts, and Creative Outlet Dance Theater in Brooklyn. The Trinidadian dancer has also performed multiple times with Beyoncé under the direction of Frank Gatson. Widely known as the captain of Beyoncé’s backup dancers, Ashley Everett has also danced for Usher, Ciara, and Ne-Yo, among many other artists. She has also made appearances in numerous commercials, music videos, and concert tours. Everett got her start in New York City at the Alvin Ailey American Dance Theater, where she met choreographer Frank Gatson, Jr., who introduced her to Beyoncé. Everett declined to study at Juilliard to join Beyoncé on her 2007 world tour, and has been a part of the team ever since. After being on a full scholarship in the Washington Ballet trainee program, Nardia Boodoo moved on to her first season as a dancer within The Washington Ballet’s studio company. Boodoo attended Baltimore School for the Arts for five years, followed by the North Carolina School for the Arts. Boodoo then moved on to the Professional Training Program at the Dance Theater of Harlem before becoming a trainee at the Joffrey Ballet School in Chicago. Boodoo has had roles in major productions such as The Nutcracker, Don Quixote, and was lead in Jeremy McQueen’s Black Iris. Adji Cissoko may not have become a dancer had she passed a coordination and spacial awareness test at age 6. Her difficulties prompted the ballerina’s mother to enroll her in dance classes. 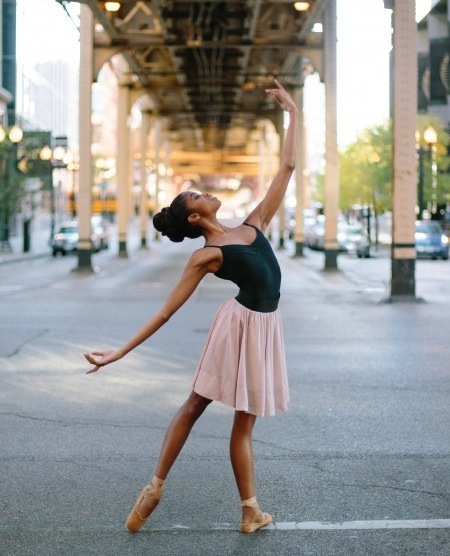 Cissoko got her start at the Munich Ballet Academy before attending American Ballet Theatre’s Jacqueline Kennedy Onassis School on full scholarship. Each year her dance studies intensified, which resulted in her attending night school for her academics. In 2009, Cissoko competed in Switzerland at the Prix de Laussane. While she did not make it to the finals, the opportunity led her becoming a member of the National Ballet of Canada in 2010. In 2014, she joined Alonzo King’s LINES Ballet.